I love the Brighton buses. Every stop has a sign telling you how long it is before your bus arrives. I also rather liked the sound of seagulls when I woke in the morning a stone’s throw from Brighton beach. But I discovered that residents are not so keen. I had thought that bird-related complaints would be about their droppings but actually the concern was that the gulls tear open rubbish bags and leave a horrendous mess behind. Of course there is a solution to this. Currently Brighton Council’s recycling lorries don’t collect food waste. 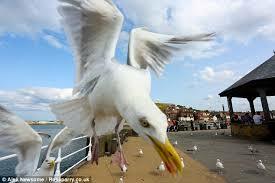 But if there was a weekly collection of food (from lidded bins), the seagulls wouldn’t have such a feast. And the rich organic material could be converted into biogas to power the refuse vehicles and perhaps even the wonderful Brighton buses too. The day after this book signing trip to Brighton (organised by City Books) I tried out my ideas on packaging and waste issues at a lunch session of the Resources Recovery Forum (organised by Resources not Waste) – a group of industry experts on the subject. I started with an explanation of why I think the Women’s Institute have got it wrong with their campaign encouraging people to choose biodegradable and recyclable packaging. There were strong views around the table about the disadvantages of biodegradable plastics – not only because the rotting process releases greenhouse gases but because they’re fouling up plastic recycling schemes. Although the Forum were enthusiastic at finding a consumer voice explaining why plastic bags are actually better than paper bags. I should point out that I did make it clear that we need less of all disposable bags, whether paper or plastic. Amongst the other issues I raised were the problems caused by measuring recycling waste materials by weight rather than volume. First this means that although the public are more concerned about plastic waste, collection authorities focus on glass bottles and newspapers because they weigh more. More worryingly, it also means that newspaper collections that sit in outside skips will count as a higher proportion of recycled waste if it rains because they’ll be wet and therefore heavier. That’s ridiculous but true. Another nonsense is that it’s illegal for pubs, clubs and restaurants to use domestic bottle banks. Their waste is classed as commercial and needs to be paid for. This means that many of these premises fail to recycle, even though they have large volumes of glass and cans. Going back to Brighton. One of the people attending my talk about The New Green Consumer Guide told me that she organised milk bottle top recycling (plastic tops rather than foil ones). I was delighted to hear this because I always collect my bottle tops but have nowhere to put them. Her problem was that some retailers were putting stickers on these tops, which makes it difficult to recycle. This entry was posted in About me, BLOG, Campaigning, Done, News 2007, Plastics, Waste & Recycling and tagged Marine, Recycling, Waste.